difficult shower housings when replacing cartridges. wall mounted or hand held showers. Contains standard thread and will fit 99% of all shower fittings. Works with both wall mounted and hand held shower head designs. Throw away design to eliminate the inconvenience of having to open some difficult shower casings. Not affected by water temperature or pressure. Can improve common ailments caused by chlorine exposure including eczema. Includes 1/2" male and female either end to make installation simple. Chlorine-free showers. Can be used with wall mounted or hand held hose shower filters. 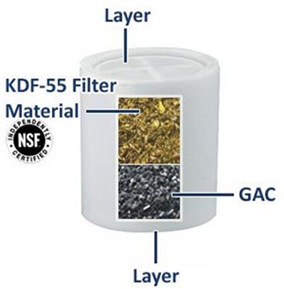 Includes KDF55 for the removal of the drying effects of chlorine and heavy metals. Improves both skin and hair making it soft and smooth. Unit is totally replaceable eliminating the need to undo sometimes difficult housings. We Love it! It is great having a shower without all the chemicals. Recommend it highly!